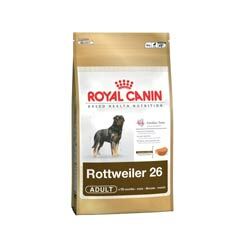 Royal Canin Rottweiler is specially formulated for the needs of your Rottweiler. The combined action of borage oil and biotin reinforces the hairs softness and sheen. Helps hair growth and strength with optimal level of sulphur amino acids for synthesis of keratin. The exclusive formula and kibble shape will help your dog to keep to a healthy weight. Copyright © 2011 Scarlet Macaw Petshop. All Rights Reserved.